Anthony Justin Fernando has always made his living from the sea. For years, he lived comfortably by selling his daily catch at a church-run fish market in Negombo, outside the Sri Lankan capital, Colombo. When business was good, he could even export different kinds of fish to overseas markets. But times have changed. Now, when he casts his nets, he hauls in fewer fish. "Fishermen face unexpected strong weather at sea," said the 54-year-old Catholic fisherman. "Some of the species have disappeared entirely. Sea erosion can be seen in my area and I'm catching fewer and fewer fish." Environmentalists say climate change is already affecting the world's fishermen and farmers. Fernando, who heads the St. Sebastian Catholic Fishermen Association, doesn't know where the blame lies. He just knows his life is more difficult today. 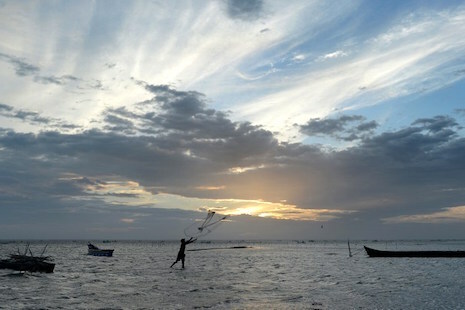 Many Sri Lankan fishermen are Catholic, owing to the church's focus on marginalized communities. These fishermen still depend on increasingly erratic weather patterns to make a living. "I don't know if it is because of climate change, but local environmentalists are saying it," Fernando said. "These changes are unbelievable experiences in our past life." Starting Nov. 30 in Paris, world leaders will meet for a highly anticipated United Nations summit on climate change, where they will once again attempt to hammer out a binding agreement to reduce carbon emissions and counter the effects of a changing planet. For Catholics, the issue has taken on heightened importance because of Pope Francis' May encyclical on the environment, Laudato si'. In it, the pope highlighted how humans have contributed to environmental degradation and climate change, and the importance of caring for "our common home." "The depletion of fishing reserves especially hurts small fishing communities without the means to replace those resources," the pope said. In countries like Sri Lanka, such warnings have an added sense of urgency. Countries in South Asia are among the most vulnerable in the world to the impacts of climate change. For example, the Intergovernmental Panel on Climate Change — a scientific body set up through the United Nations — predicted that crop yields in South Asian countries could plunge by 30 percent by the end of the century, due to factors such as water scarcity. Similarly, predictions from Sri Lanka's Department of Meteorology suggest that that fluctuating monsoon patterns caused by climate change could trigger water scarcity in parts of the country, placing a heavy burden on already marginalized farmers. 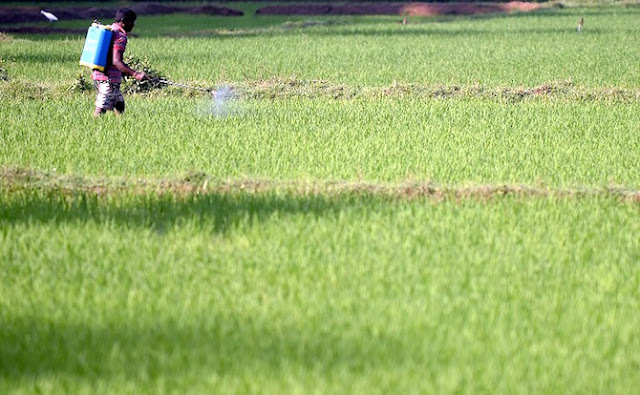 Like members of the fishing community, farmers in Sri Lanka are already reporting problems, including changing rain patterns that have threatened their traditional cultivation methods. To cope, many have turned to harmful chemicals to boost their chances of successful crop yields. But this comes with alarming side effects. "Hundreds of farmers are dying from unidentified chronic kidney disease, and medical experts say it is because of agrochemicals, which are used for farming," said M.K Jayatissa, co-secretary of the Progressive Peasant Federation in Polonnaruwa, in central Sri Lanka. Authorities say they are keenly aware of the possible effects of climate change on Sri Lanka. Like many countries, Sri Lanka's emissions of harmful carbon dioxide have soared over the last two decades, though its comparative emissions per capita are relatively low — ranked 113th of the world's countries, according to the U.N. Climate Change Secretariat. As a particularly vulnerable country, authorities are focusing on ways to adapt to the effects of climate change. "The country is already getting ready for a lot of preparatory work on climate change," said R.M.P. Ranasinghe, an officer with Sri Lanka's climate change secretariat within its Ministry of Environment. She pointed to a "national adaption plan" currently being compiled with input from academics and civil society. Sri Lanka's Catholic Church, too, has its eyes on the issue, though many of the efforts underway came only after the pope's encyclical was released and include mainly "awareness programs" and explanatory discussions on Laudato si'. These included attempts to explain the encyclical to clergy in various dioceses. Father Reid Shelton Fernando, a university lecturer and chaplain of the Young Christian Workers movement in Colombo Archdiocese, said Christian civil society groups are also extending the outreach beyond the church in an attempt to apply the pope's words to local life. For example, activists have recently expressed their concerns about a massive offshore port project near Colombo that is being built with minimal concern for environmental impacts, the priest said. The encyclical has also been translated into Sinhala, the dominant language in Sri Lanka. "It will be a boon to the activists on problems of deforestation and pollution," Father Fernando said. Still, these initial advocacy efforts don't take the place of immediate action, which environmentalists say is crucial to addressing climate change. Hemantha Withanage, executive director of the Colombo-based Center for Environmental Justice, said Sri Lanka is already facing the effects of climate change: rising seas, floods, monster storms, landslides and prolonged drought. "Traditional seed banks have been destroyed, the drought is too harsh, floods are too strong and difficult to survive, and some pests are increasing due to the hot climate," said Withanage. While world leaders discuss climate change in Paris, people on the ground in vulnerable countries like Sri Lanka are already dealing with its effects. "Climate awareness is necessary for every sector including civil society," he said. "Climate solutions should be discussed within the parliament."